How long do most restorations take? 6 months? A year? Two? How about 23. Some things really are best savored and taken slowly. It isn’t always easy to decide exactly what a bicycle needs. Sure, brake pads need changed, tires go flat and chains need lubed but what is a bicycle telling you? Spending time observing, contemplating and listening is important. Then again, so is serendipity. Kris’ Motobecane may have been love at first sight but it took a twist of fate and an impulse to bring a jewel to light to bring it back to better-than-construction condition. This story is more than just a restoration. It is patience, an eye for right build characteristics and an ever-burning love for a legendary frame from the pinnacle of the Golden Age. It’s also exactly the story flavor that I am thrilled is bestowed on me so I may use this platform to present it to you. Are you passionate about a particular bicycle? Does it have a background that is special and worth sharing? If so, it would be my honor to showcase and commemorate it for all to see and read about through Tell Your Story. The story behind my 72′ Motobecane Le Champion and my obsession with French racing bicycles started long before I obtained the bike you see here in pictures. I grew up during the bike boom of the early 70’s and for my 12th birthday my parents bought me a metallic, root beer brown, Japanese 10-speed called a “Premium.” While most of my friends were riding Schwinn Varsity’s and Columbia 10-speeds my bike was a little different. As with those bikes, the frame and components were all steel but the fit and finish of my bike seemed a little better. The frame was fully lugged, not welded, and was much lighter that my friends models—and it was $20 cheaper to boot! My father being a car salesman knew a good value when he saw one. Around 1971 things started to change in my bike world, some of the older kids and kids whose parents had the means were showing up around the neighborhood on these beautiful bikes from Europe. Exotic brands that I had never heard of before such as Peugeot, Gitane, Mercier, Jeunet and Masi. I was bit and had the bug! I would spend Saturdays hanging out at the local bike shops drooling over the exotica hanging on the racks—it truly was a magical time in my adolescence! One day I went with some friends to a shop in a neighboring town that was known to carry very high-end (for the times) racing bikes. Immediately I saw it hanging on the wall sitting between a multi-colored Super Mondia and a yellow and black Motobecane Grand Record. 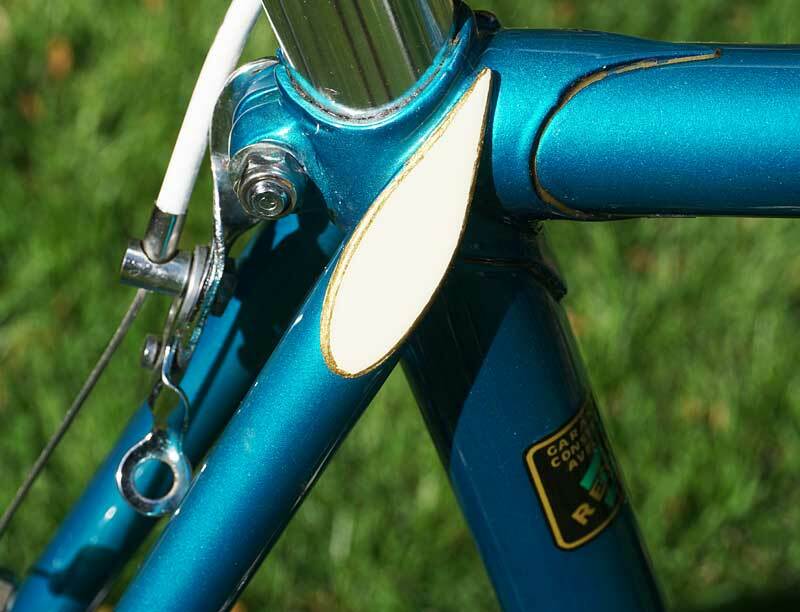 There it was—a teal blue Motobecane Le Champion in all it’s glory with gold and white accents and gold decals that looked like they had been hand-painted on. By this time I had been studying bikes and I knew this one was something special. The paint, the finish, the gold pin striping around the lugs, was all perfect. 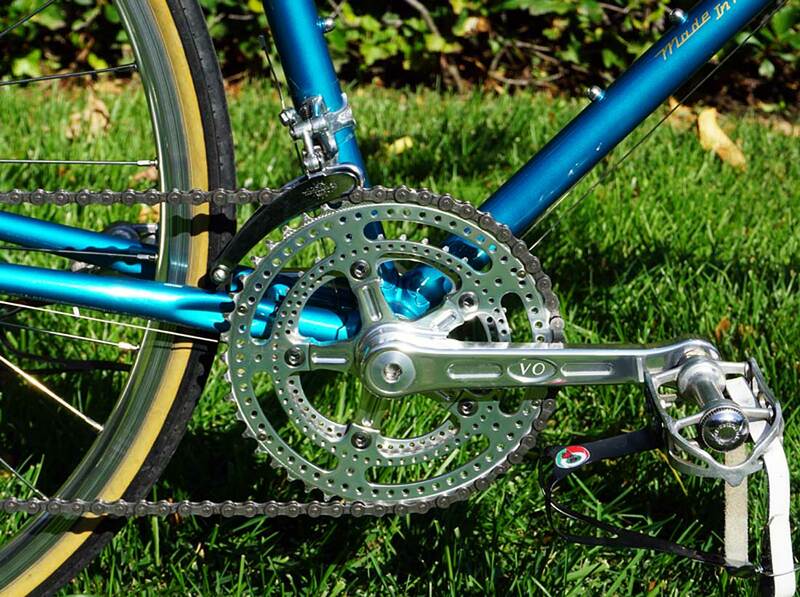 This was not your run of the mill, mass-produced French 10-speed! 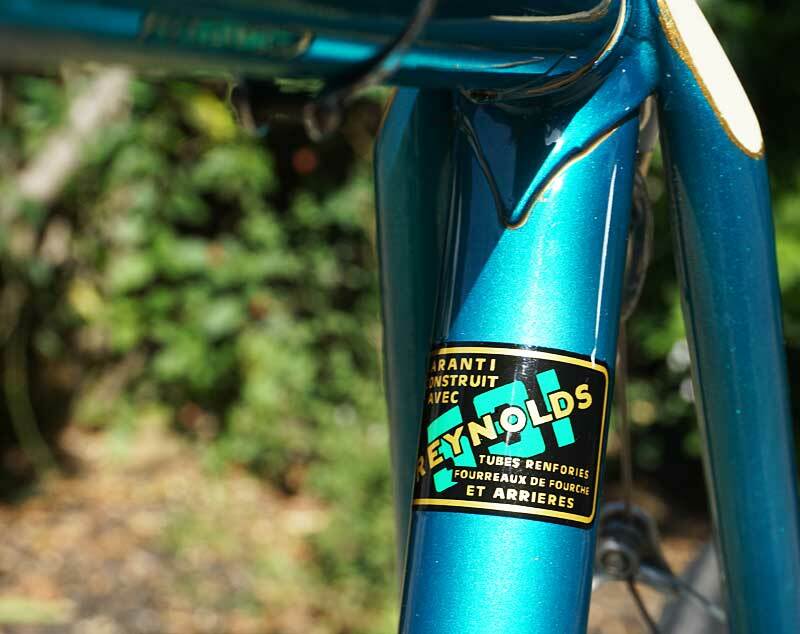 While most of the Le Champions French counter parts shared its Reynolds 531 frame tubes, their similarities stopped there. 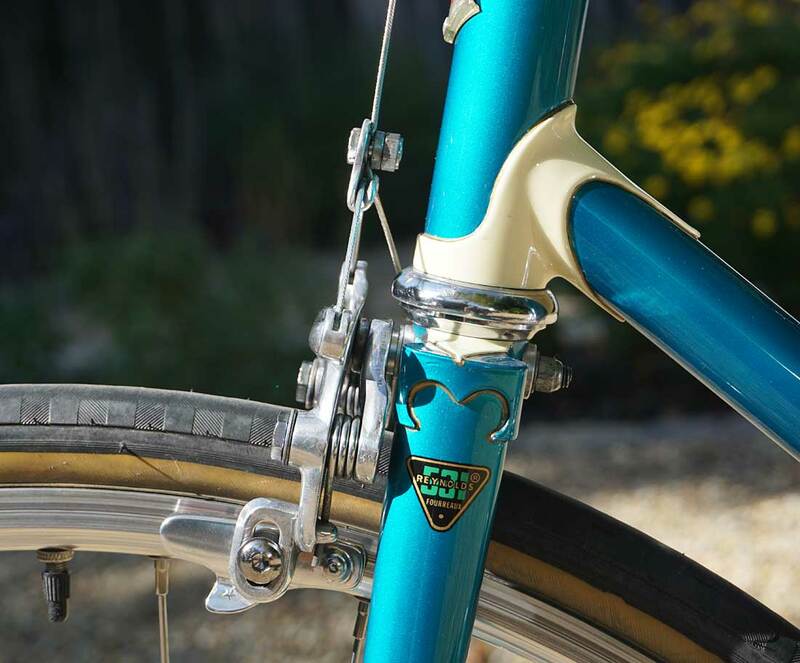 Models like the Peugeot PX10 and Gitane Tour De France primarily used French components. On the other hand the Le Champions came equipped with some Italian components from Campagnolo, Universal, and 3T with the exceptions being the Stronglight cranks, Lyotard pedals, Mavic rims and Sedis chain. My fire was lit and I knew someday I would have a Motobecane! Skip ahead to 1976, my senior year of high school. My parents gifted me a black and red Motobecane Grand Record. It wasn’t a Le Champion but it was just as beautiful and was my main ride for next seven years. I am proud to say, I still own the Grand Record to this day. Now, skip ahead again to 1992. 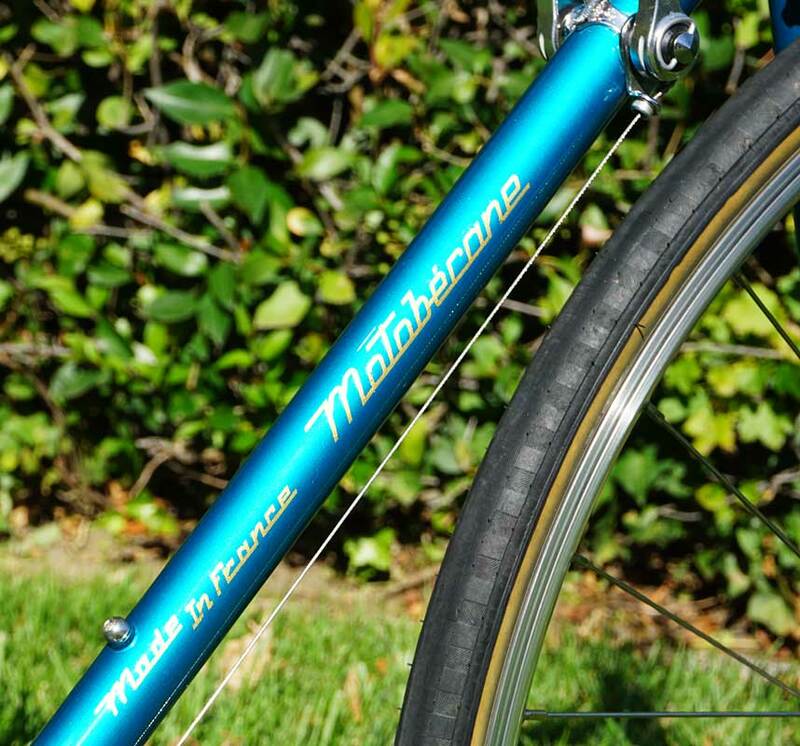 Knowing I’m into vintage, French 10-speeds, a good friend of mine informs me of a mutual friend that has a Motobecane for sale. Our friend’s uncle had given him the bike but he didn’t know what the model was or what he had. When we showed up at his house, I was shocked and delighted to see this was the same model teal blue Le Champion I had seen hanging in that bike shop so many years ago. Although the bike showed evidence of damage, it was complete and $50 later, the bike was mine. So began my 23-year, on-and-off odyssey of restoring the Le Champion. Initially, I put the bike back on the road by completely overhauling it and replacing the tubular wheels with Weimann clinchers and Maillard Helocromatic hubs, raided off a mid-80’s vintage Peugeot. I rode it in this configuration, with a slightly bent fork, until 2014 when I received an email from Cycle Art that intrigued me. They offered a 15% discount on frame restorations, including painting and repairs along with modifying your vintage steel frame to run a modern, 10-speed drivetrain and offered an STI equipped Campagnolo Veloce kit to bring your frame up to the present date. For years I’d wanted my Le Champion restored back to its former glory and this was the opportunity I had been looking for. But even with the discount, I knew this wasn’t going to be an inexpensive project, especially if I was going to have it built up with modern components. Keep the authenticity and originality of the bike as much as possible while maintaining its eligibility for Eroica events. 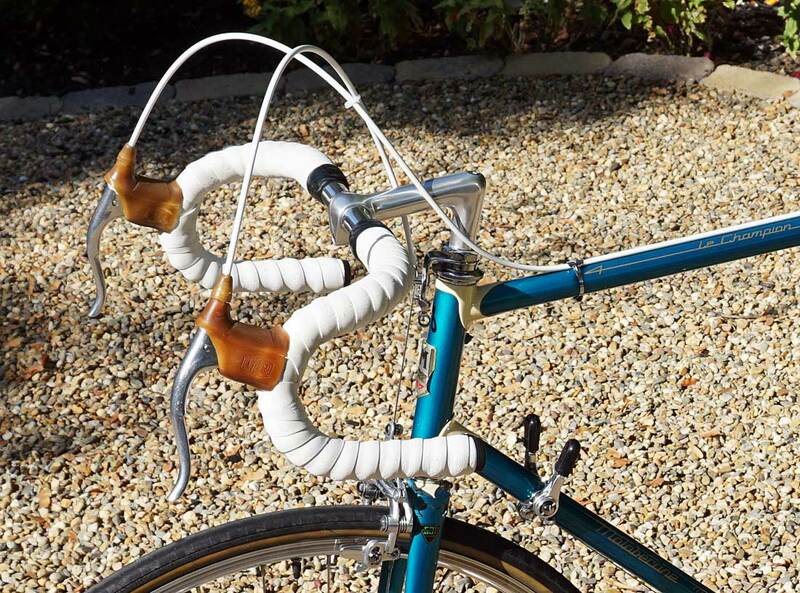 Add modern touches were appropriate, such as new water bottle cage braze-ons and pump peg, but at the same time keep most of the chrome Campagnolo frame fittings. Update rear spacing to have the ability to run a modern, wide ratio, 9-speed drivetrain while maintaining friction shifting. These requirements were no problem for Cycle Art. They began the restoration by modifying the rear drop out spacing to 130mm. Then added modern components that updated performance but gave a nod to the Le Champion’s vintage heritage. New, high-flange SunXCD hubs and wheels, a Velo Orange Grand Cru drillium compact double crankset and ENE downtube shifters, to name a few. 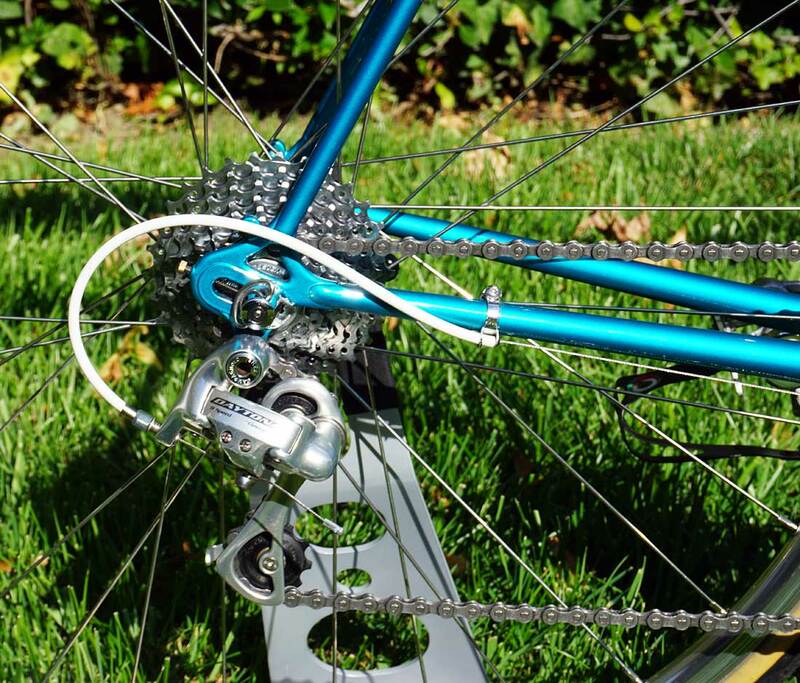 The rear derailleur is Campagnolo Daytona 9-speed and NOS Nuovo Record up front. 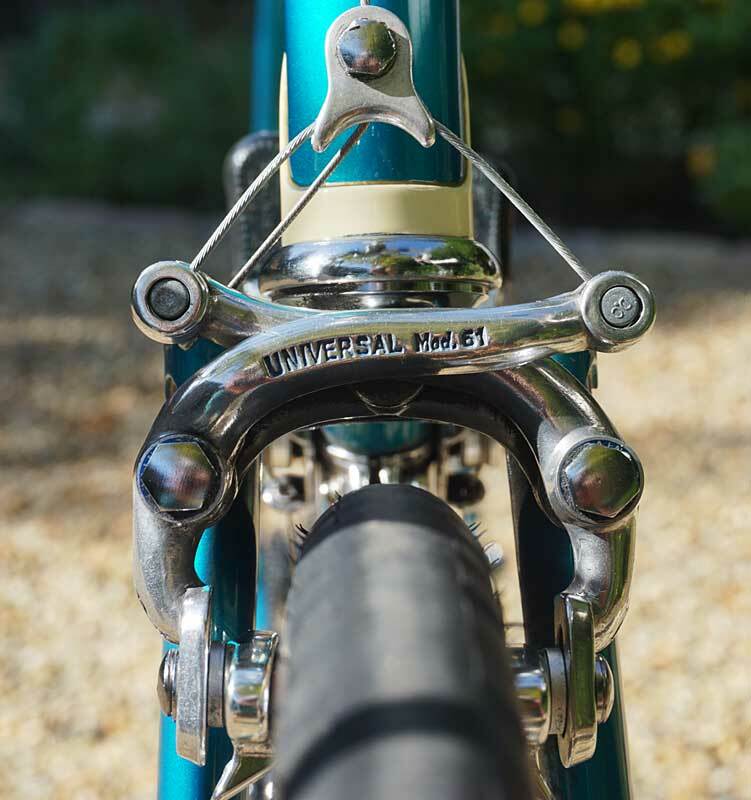 Also sprinkled in are original components such as the equipped Universal 61 centerpull brakes, NOS Universal brake levers and original Lyotard pedals. 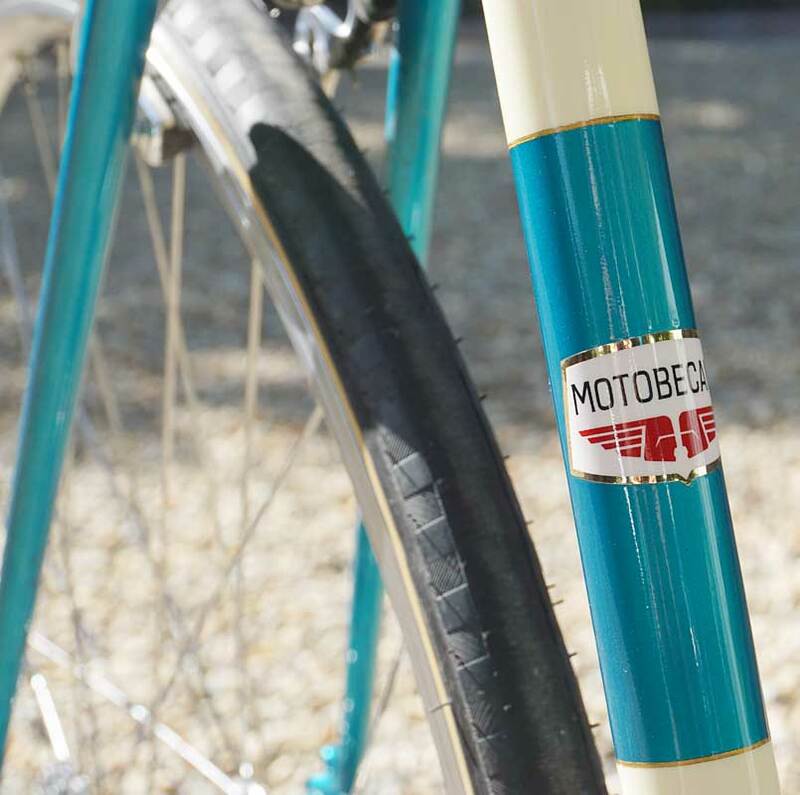 In addition to the frame modifications and fork repairs, Cycle Art also applied their premium multilayer paint and clear coat over custom replica 1972 Motobecane decals. They then added a cream head lug, seat tube panels, gold pinstriping and a replica French Reynolds 531 decal finish off the paint package. So, how does it ride? Like a magic carpet! Comfortable, stable at speed, corners like its on rails and believe it or not, it accelerates pretty well for a heavy 23-pound bike! The Le Champion is a simply a pleasure to pedal, looks drop-dead gorgeous and is a keeper that I’ve carved out a spot for as a permanent heirloom in my stable. © Josh Capps and The Simplicity of Vintage Cycles. Unauthorized use and/or duplication of this material without express and written permission from this site’s author and/or owner is strictly prohibited. Excerpts and links may be used, provided that full and clear credit is given to Josh Capps and The Simplicity of Vintage Cycles with appropriate and specific direction to the original content. Correction the the rear derailleur…..It’s a Campagnolo Daytona not a Centaur….Oh well don’t know how i missed that one……LOL! Cheers and Enjoy my bike! Thanks Josh…don’t know why I didn’t caught that earlier. Love the Post and your introduction..
Wow what a great bike and an awesome story. I am a sucker for Motobecanes, just did a tear down on my 78 Grand Touring to being a restoration, and that may be the most lovely example I have seen yet. Chapeau! Agreed, Ryan. What a bike… and a story! I’m thrilled we could put it together for everyone to enjoy. Kudos to Kris! Funny thing, my very first post, years ago, was an homage dedicated to a custom painted, and unknown model, Motobecane. It was my first steel bicycle purchase, coming from an old wrencher who sold off all his old steel frames to ride recumbents because of health issues. He loved the bike and once I acquired it, I did too. I had it for years, taking care to only ride it during good weather (IE: no winter commuting). It was painfully the wrong size for me and in the end, I sold it. To this day, it is the only bike I regret selling. That says a lot as I’ve had many go through my hands. I was constantly trying to figure out the year of the frame and model as the old wrencher didn’t know. I do remember taking note that the headbadge was the key to discovering the production year. Yet, despite my research, I couldn’t nail down that timeframe. So seeing Kris’ Le Champ let’s me know roughly the time span which it was produced. Just another reason why this post is so great! Cyclart seems to be defunct now! The email addresses on their website come back as un-deliverable and their phone is never answered. I guess I will have to look for another provider for services like that. Actually they have moved to the Midwest and are supposedly working out of a bike shop there. If I can find their new address I will forward it to you. This entry was posted on April 30, 2018 by Josh C. in Tell Your Story, Topics and tagged 130mm spacing vintage frame, Campagnolo Daytona, Campagnolo veloce, Cycle Art Paint, Drillium, head lug paint, modern spacing, Pinstriping, Reynolds 531, seat stay cap paint, seat tube panels, SunXCD, Universal 61 centerpull brakes, Velo Orange Grand Cru, vintage bike restoration. Enter your email address to follow Simplicity and receive notifications of new posts by email.